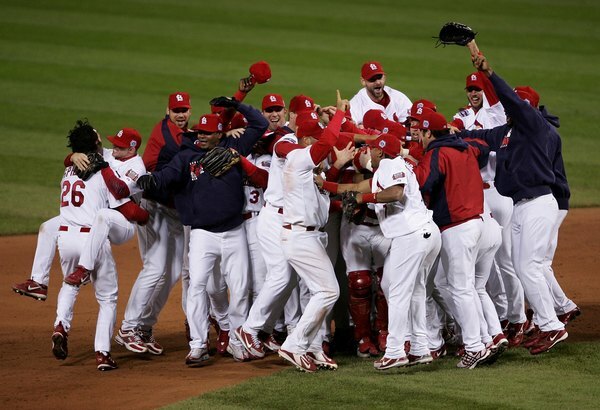 Tim McCarver, the one time Cardinal catcher and now color commentator for Fox Sports said it best moments after one of the most improbable and dramatic games in the history of the World Series: How did that happen? Down to their last strike in the bottom of the 9th and 10th innings and each time depending on a pair of 2-RBI desperation hits before the game-ending, walk-off homer in the 11th by a guy who nearly cost them the game by dropping a pop up earlier in the contest, the St. Louis Cardinals are not just the comeback kids. They are Lazarus, Jason and Dracula rolled into one- anything that’s ever come back from the dead. The last day of the regular season, the single most dramatic evening to ever close out a baseball season and memorialized here, seems now like just the appetizer for the main meal that was served last night in the Cardinal’s 10-9 win over the Texas Rangers. It was on that last day of the season that St. Louis completed its comeback from 10 and a half games back on August 25th to take their place in the playoffs. Baseball is often humbling. But it is also a vehicle for redemption. When Cardinal 3rd baseman, David Freese, dropped that easy pop up in the 5th inning and the Rangers capitalized and took the lead, he looked for all the world like the goat. And when he was down to two strikes with two out in the bottom of the 9th, he was looking like a cooked goat. Except he tripled. Two runs scored and the Cardinals had tied the game. That they would do the same with Lance Berkman one inning later with two strikes and two outs is, of course, insane. And when Mr. Freese stepped up in the bottom of the 11th and hit his walk-off homerun to force a deciding game 7 Friday night, well, it was, as usual with this sport, stranger than fiction. I would be very surprised if the Rangers recover from one the most devastating losses in the history of the Fall Classic. When Red Sox 1st baseman, Bill Buckner, had a ball go between his legs in game 6 of the 1986 World Series against the New York Mets, everybody knew what would come in game 7. And like the Mets, I have a feeling these Cardinals are also a team of destiny. Before the game, the Cardinals carted out every conceivable living hero in their storied history; Bob Gibson, Lou Brock, Ozzie Smith, Stan Musial. It took that, and probably the ghosts of every other Cardinal who ever played, plus 50,000 screaming, towel-waving fans, several dollops of fate and a pinch of outrageous fortune to pull this thing off. Twice, they’d put up the plastic in the Rangers dressing room and put out the cold champagne and prepared for the presentation of the championship trophy. And twice they took down the plastic and carted the champagne away. Definitive proof that in the greatest sport ever devised, it is always the final out that’s the toughest.